Time to face it (excuse the pun) but nobody goes on Facebook to read the ads. While it is true that great branded social media content (like videos and experimental advertising) can be important components to a media mix, standard Facebook tiles and boosted posts can sometimes be a bit…well…boring. However, the new offering from Facebook called Canvas offers advertisers a fully immersive way to engage users that puts carousel ads and standard tiles and boosted posts to shame. And here’s the secret part…they aren’t that hard to make! When it comes to telling great brand stories Algo Mas is always curious to learn about new media platforms. 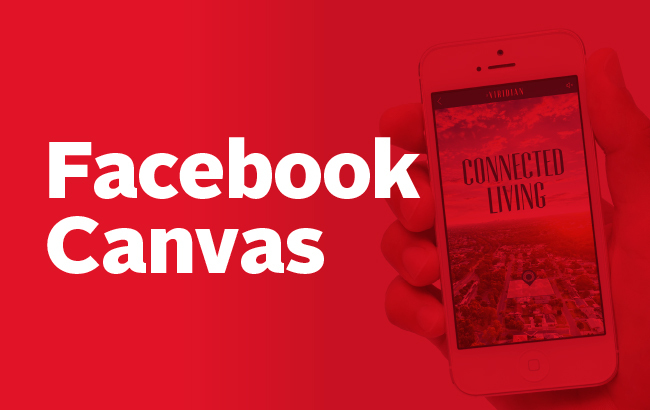 Facebook Canvas is a full-screen, mobile optimised ad experience built for bringing brands and products to life within the Facebook app. Our design team has been itching to use the new Canvas software and recently we got given the chance to build one by our client Barrio Developments for their housing development The Viridian. We think the finished product speaks for itself. We incorporated four 3D videos into the canvas which allowed the target audience to take a virtual 3D tour of The Viridian development and discover the design features of the home via this immersive platform. Combined with panoramic photography, some clever copy and graphics we created a truly great ad. We’re committed to building great social media experiences for users, not just basic ads. Through this commitment, we are opening clients to great creative that is impactful and cost friendly. Talk to us today about getting something more from your social media.